If you’ve ever found yourself on this website for more than five minutes, you probably already know how I feel about Glossier. Pretty much since the brand first launched four years ago, I’ve been curious about the company’s mission and the products that they launched. The conversation that Glossier wanted to have with its customers felt like something that was missing from the beauty space and something that I’m especially grateful for for a few reasons. It was one of the brands that made me really curious about beauty, which is now nothing short of an obsession of mine, and it was a brand that made me feel like I could be a part of the conversation of beauty. For a while I stuck in my comfort zone and only used the same handful of products over and over again (I remember literally shaking before I published my first-ever beauty post) but in the last few years I’ve branched out so much and am now testing out new products every single week. 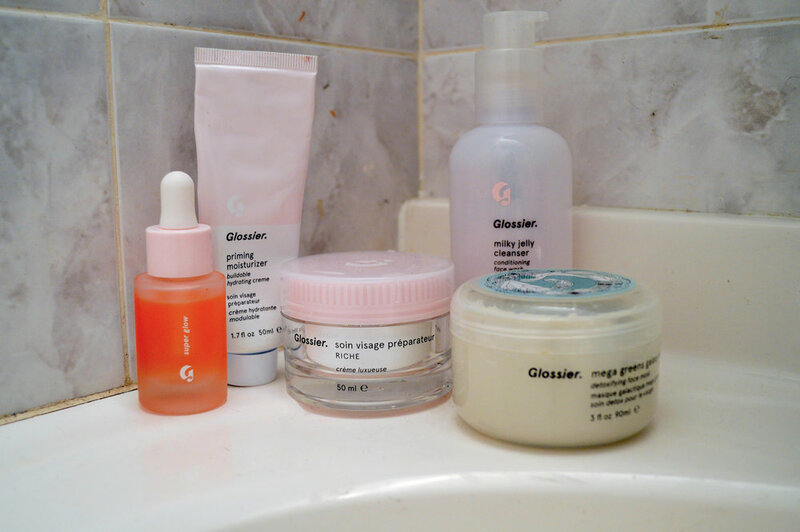 I’ve already written about Glossier extensively on this blog—it even has its own section. But I figured that tomorrow’s brand anniversary would be a fun time to reflect on some of my favorite things I’ve written about the brand over the years and also share some of my favorite videos featuring Glossier products with you all in case you don’t get to pop over to my YouTube channel that often. Plus scroll all the way to the bottom to discover the five Glossier products that I can’t live without! I always do a video whenever Glossier launches a new product so it was really hard to just pick a few videos! My Lash Slick review is my most-watched video ever so I knew that had to be included. I also really enjoyed the video where I tested out Solution over two weeks because lots of people were reviewing the product without documenting their results and I wanted to provide useful information on the product to my readers/viewers. I also threw in my full face of Glossier video because I got to use pretty much every makeup product in that video, as well as my updated skincare routine, which contains tons of Glossier products. 5. Lash Slick - I really thought Lash Slick was going to be something Glossier over-hyped but wow this stuff is good. It rarely smudges on me and is lengthening and separating in the dreamiest way. 4. Super Pure - Super Pure has helped my face so much over the years and is particularly good at making irritated areas look and feel much better. 3. Skin Tint - On days when I just can’t deal with foundation, Skin Tint in medium is my go-to. It’s also the only base product I use in the summer months because it’s too damn hot for anything else! The only complaint that I’ve ever heard about this product is that the coverage is too light so if you prefer heavier foundations this won’t be your thing, but if you like that fresh-faced look you’ll fall in love. Have you ever tried Glossier? What’s your favorite product?